One of the updates in the 1996 National Electric Code was to require grounding on 220-volt circuits, such as dryer outlet wiring. After this update, all dryer receptacles are required to have four wires instead of three. The code requirement doesn't apply to houses built before 1996, though. If you live in an older house, it's legal to keep your three-wire circuit, and if your outlet wears out, you can replace it with a three-prong one, such as a NEMA 5-30P, which is rated for 30 amps. The better thing to do would be to run a new cable with four wires and install a four-wire receptacle, such as a NEMA 14-30P. That would conform to current codes because it has a separate ground wire. However, if you love your old dryer, and its cord has only three prongs, you might want to go ahead and install a three-wire receptacle anyway. Why Are the Number of Prongs Important in Dryer Outlet Wiring? A 220-volt circuit doesn't need a neutral wire. Each of the hot legs acts alternately as the hot and neutral as the electricity changes direction 60 times a second. However, the neutral wire is needed if a 220-volt appliance has features that run on 110-volt power, such as a clock or a light. In the past, the neutral path was provided by the ground wire, so the receptacle needed only three wires: two hot and one that combined neutral and ground. Things have changed. The National Electric Code currently requires every circuit to have a separate ground wire. The neutral and ground can no longer be combined into a single wire. The reason for this change is safety. Stray current in a three-wire, 220-volt circuit can run along the ground/neutral wire to the appliance being powered, creating the potential for a serious shock. In a four-wire circuit, the stray power runs safely to ground. You need three 10 AWG wires for dryer outlet wiring. Two wires – the red and black ones – connect to a double-gang circuit breaker in the panel. The third wire may be white, green or bare, and it connects to the ground bus in the panel. Look for two brass screws on the receptacle and connect the red and black wires to these screws. It doesn't matter to which screw you attach red or black. The other wire connects to the third terminal screw. Bending 10-gauge wire is difficult, so instead of trying to wrap the wires around the terminal screws, it's better to crimp a ring lug onto the end of each wire. When you attach the wire to a terminal, simply remove the screw, pass it through the lug on the wire that goes on that terminal and tighten the screw down. This makes a more secure connection with little effort on your part. If you love your old dryer, but you think safety demands that you install a four-wire receptacle, don't fret. You can still use your dryer. You can change the cord or, even easier, you can use a three-prong-to-four-prong plug adapter. The same is true if you buy a new dryer and need to plug it in to an old three-wire receptacle. Simply buy a four-prong-to-three-prong adapter. 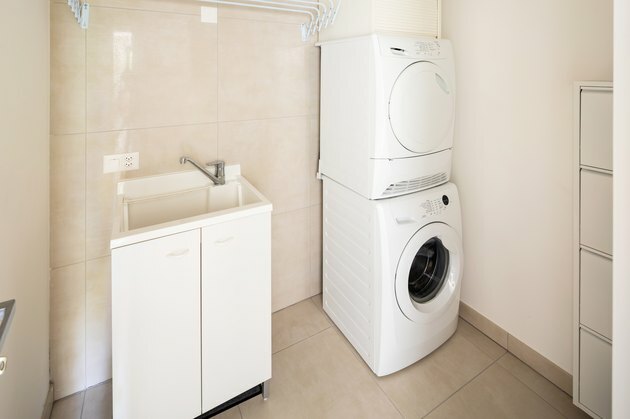 As long as you don't mind that the appliance isn't properly grounded according to current National Electric Code standards, you'll be able to use your dryer normally. Do You Need a New Power Cord With a New Dryer or Do You Reuse the Old One?